McLaren has taken the wraps off their new track-dedicated version of the P1 ahead of its official debut at the 85th International Geneva Motor Show. The GTR moniker first saw use on the string of McLaren F1 GTR race cars built in the mid-1990s (with which the P1 GTR shares its stunning Geneva-bound livery), and denotes that despite being based on road cars, these GTR models are squarely focused on road course supremacy. The 3.8-liter twin-turbocharged V8 hybrid drivetrain has been dialed in for optimal performance in a track setting, with the V8 dishing now out 789 horsepower and the electric motor offering another 197 ponies, increases of 62 and 21, respectively. That brings the total output up to a fairly outrageous 986 horsepower. 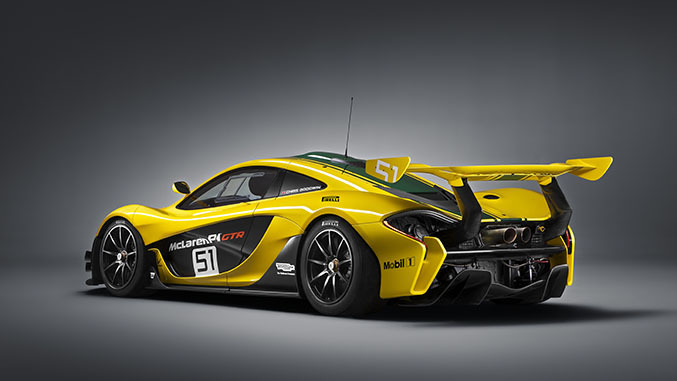 To further bolster track performance, the P1 GTR also sheds some 110 pounds over its road-going counterpart by way of a host of light weight component swaps, including a carbon fiber roof (rather than glass), plexiglass side windows, and a new titanium alloy exhaust that shaves off 14 pounds all on its own. Without the imperfections of public roads to consider, the engineers in Woking went ahead and lowered the suspension of the supercar by two inches and widened the track by three, while 19-inch alloys wrapped in Pirelli slicks come as standard footwear on the P1 GTR. The aero kit also sees some retooling, with a large fixed rear wing and revised front splitter helping to boost downforce by ten percent over the road car, which equates to 1455 pounds of downforce at 150 mph. For tracks where top speed is a bigger priority, the DRS (Drag Reduction System) flap from the standard P1 carries over to the P1 GTR, and will allow the driver to change the pitch of the wing from 32° to 0° via a button on the steering wheel. Similar to Ferrari’s Corse Clienti program provided with the FXX K, the P1 GTR will be part of a bespoke driver’s program which will start at the McLaren Technology Center to have seats fitted, a custom livery designed, and a fitness assessment conducted before heading out for their first track sessions at Silverstone in the UK and Catalunya in Spain. 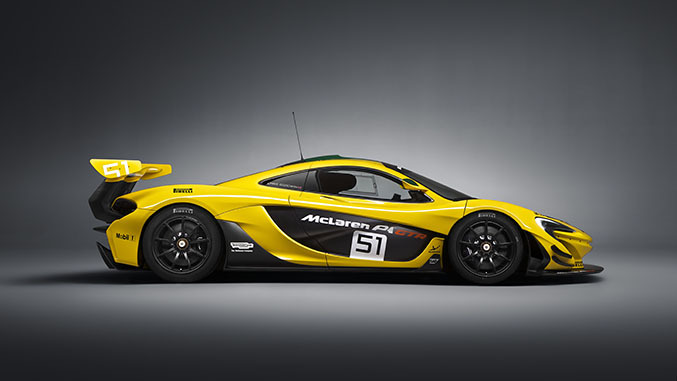 McLaren P1 GTR will available for ogling alongside the recently announced McLaren 675LT at the Geneva Motor Show in Geneva, Switzerland on Tuesday, March 3rd. Have a look at the video to see the GTR(s) in motion and press release below for additional details. Stay tuned for more updates as we have them.